I ended up making an unplanned purchase last week. With Alter's Exceed Mode Nanoha still scheduled for release this month, plus the movie version figma, Reimu figma, No More Heroes 2 and Tasunoko vs Capcom I'm in no position to leisurely spend money this month. Well, what's done is done. At the very least I'm happy I get to mark off a figure from the years before I started figure collecting. Every time I saw Danny Choo's desk I craved GSC's instructor uniform Nanoha. I shall crave no more since for some reason or another Hobby Search stocked her and I bought her on impulse. 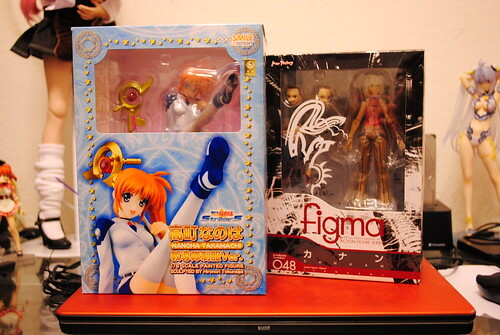 I also picked up figma Canaan to make the shipping a little more worth while. With this it only leaves two other older figures I must get my hands on. Max Factory Sawatori Makoto and Flame Haze Shana. If anyone is willing to part with them for a reasonable price I will be more than happy to oblige.